Thursday's strip coming at you on a Sunday, unforgivable I know! Oh well, what can you do. Nothing! New action tomorrow for certain. Thursday is the day after the day after the day, see you back here for more brand new Flesh & Bone action or lack thereof! Can I get flies with that? THANK GOD! Life was all a dream! Furries...giffers...come forward with more information/photos if you have it. 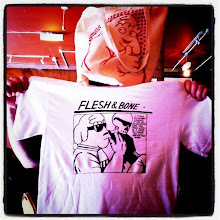 Meanwhile, Flesh and Bone is 100! 100 entries in the database! Some were 3 frames, some were 4, some were 1 frame, some didn't even have frames! Hip hip HOORAY? See you Monday for Room 101 hosted by Paul Merton. UK got it's chill on, finally! topical trumps. 2010, year of the auto-pilot! Can't believe that Tony Blair passed that rule this year that whenever anyone calls "Massage!" you have to, by law, give them one. Wake up bLIAR, it's 2010 not 2009!